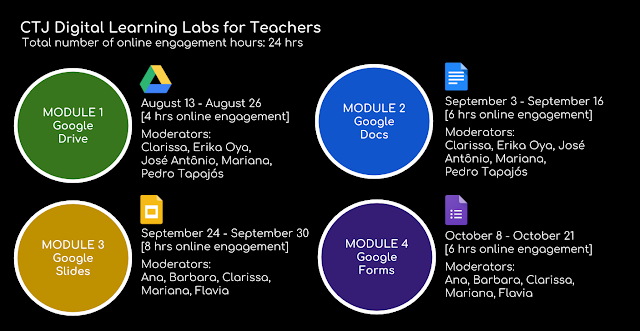 As you may already know, we are currently offering an online professional development opportunity for our teachers: the Digital Learning Labs. Similarly to Module 1 on Google Drive, we have a group of 35 teachers now finishing module 2 | Google Docs. Again with high levels of engagement, Lab teachers even wrote a wonderful collective story on a shared Google Doc. We exercised our creativity and collaborated to create something unique that belongs to this group. Imagine doing something like that with your students? Registrations are now open for module 3 | Google Slides. Many of the folks taking Lab modules so far are moving on to take module 3, as well, for they feel the need to keep developing their knowledge and skills on these tools. If you're interested in joining our learning party, click HERE and fill out our registration form. We ask you to please join by no later than September 20th.